Thick ecru cardstock with painted gold edging and black thermography. Photo courtesy of Elario Photography. While many brides find the invitation design process a bit intimidating, Sara had a bit of an advantage as a former employee of a SoHo stationery store. 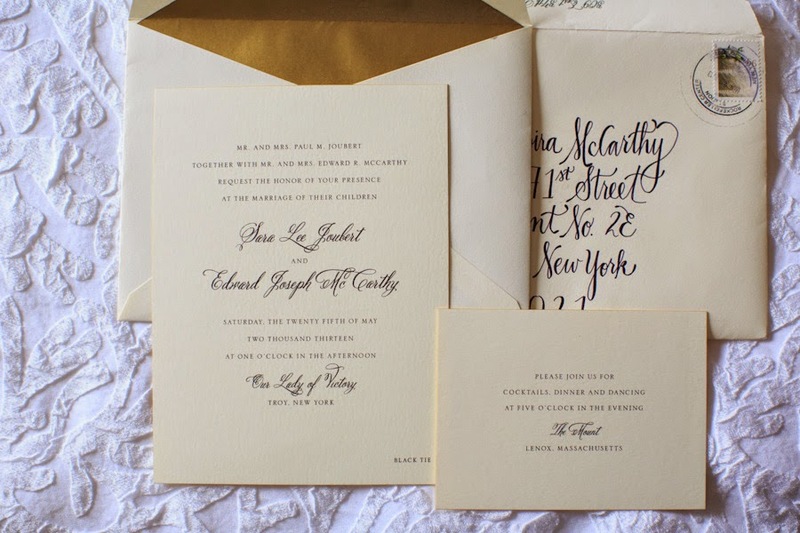 So when it came time to design the invitations for her New York-to-Massachusetts wedding (which is quite fitting, considering the couple managed a NYC-Boston long distance relationship), she was prepared. Here, she talks to us, among other things, about why, when it comes to choosing wedding invitations, timing is everything. Tell me how you and your fiance met, and how did he propose? We met at a bar in the lower east side in 2009 (it still happens!) and had a long distance relationship from NYC to Boston until I officially moved to the city. The proposal: He conned me into going to Bryant Park to meet his "new boss" at a "work function.” Of course there was no "work function." He stopped me in front of the fountain (he also had a coworker sitting at a café table with a camera to secretly capture the moment!) and began a speech both of us forgot instantly amidst the moment, got down on one knee and pulled out a ring box! Of course I screamed yes, cried (yelled at him to make sure he wasn't joking!) and hugged him. Afterward, he took me to our favorite restaurant and brought me to the wine cellar where all of our families and close friends were waiting to celebrate! It was SO special. A night I will never forget. Tell me about the process of choosing/designing your wedding invitations — did you have something in mind going into the process and did that change as the process went on? I actually used to work at a stationery store in SoHo as the custom print manager! So I was very well versed in many different brands going into the process. [William Arthur] was always at the top of my list with the ability to create something from scratch and uphold the quality I wanted within my budget. I knew I wanted something classic and romantic—mixing the thick ecru cardstock with painted gold edging and black thermography was the way to go. Describe the invitation suite you ended up with and why you fell in love with that design. Was there anything about the process of choosing/designing your invitations that you weren't expecting? Having been exposed to basically any and every possible "worst case scenario" there could be as a custom printer, I felt confident going into the process knowing what I needed to do and most importantly, when! So, no! Thankfully, it was pretty seamless! Any advice for brides-to-be on the invitation process? Definitely give yourself enough time to decide on the style you want to go with. Then even more time to go through the proofing process! Timing is everything, in my mind, when it comes to executing the perfect introduction of your day to your family and friends. I would also recommend envelope calligraphy—It adds another layer of personality to your suite. Remember this is the first look at what your guests have to expect! Tell me about your wedding! What was your favorite moment? Our wedding was the best day of our lives. Having everyone we love in one place celebrating such a beautiful commitment was everything to us. I wish I could do it over and over again! Are you a bride, bride-to-be or stationer who ordered William Arthur or Vera Wang wedding invitations? We'd love to feature you in our Real Weddings series! Email us at submissions@crane.com for more info.